Coulee Progressives: GLOBAL WARMING - do something about it! GLOBAL WARMING - do something about it! Are there credits available if you want to upgrade your energy-guzzling refrigerator? Should you think about installing a solar system on your house? Can you reduce your "carbon footprint"? Come to the Coulee Progressives State of the Union event on Friday, January 26 and find the answers to these and other pressing questions (and have fun, eat some food, network and share ideas while you're at it). Friday, January 26 from 5 to 11:30 p.m.
Concordia Ballroom, 1129 La Crosse St. Sliding scale donation ($2 to $15) to enter. Also, if you can contribute a non-perishable food item for WAFER, great! And if you can, bring a pot luck dessert to share. Free food, music, info and more. Special guest speaker (at about 7:30) Tia Nelson, 2000 EPA Climate Protection Award Winner with decades of climate change experience with the Nature Conservancy. 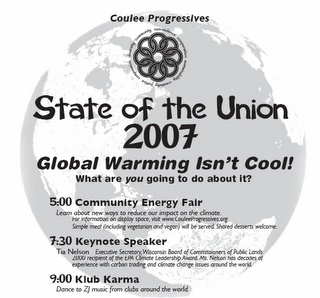 Coulee Progressives State of the Union: Global Warming Isn't Cool! What are you going to do about it!? For more information, please email RoZ. See you there! Honor Martin Luther King, Jr.